During the First World War, Canadian soldier George Cantlie sent letters home to his young daughter in Montreal and enclosed in each a flower plucked from the battle-scarred fields of Europe — daisies and lavender, lilies and roses. A century later, Cantlie's touching notes to his "Wee Celia" have provided the inspiration for War Flowers, a new multi-sensory exhibition on now through January 2018 at the Canadian War Museum in Ottawa. Curated by documentary filmmaker Viveka Melki and Les Jardins de Métis/Reford Gardens in Grand-Métis, Que., the touring exhibition explores human nature and resilience in times of war through sculpture, scent, sound, and floriography, the Victorian art of conveying meaning through flowers. Each of the 10 stations that make up War Flowers presents a theme associated with a specific flower and introduces a Canadian who served in the war and whose story reflects the theme. 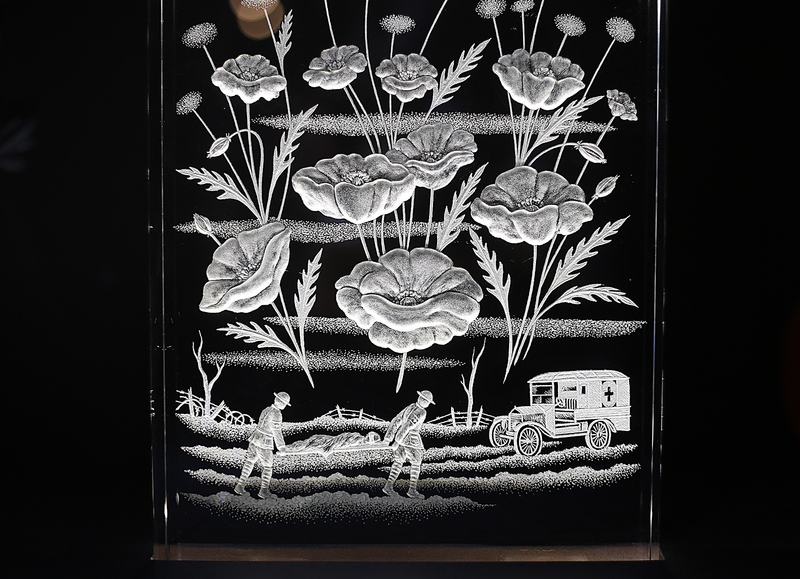 The English daisy represents "Mother's Love" and the story of Julia Drummond who, after the death of her son Guy at Ypres in 1915, went on to create the Canadian Red Cross' Information Bureau so families could more easily learn the fate of loved ones recovering in military hospitals overseas. Lavender symbolizes "Devotion," embodied by soldier Edward Savage and his wife Marion. Savage survived the battle of Vimy Ridge only to die three years later of Spanish flu; Marion never re-married. Well-known Canadians like Group of Seven artist A.Y. Jackson, poet John McCrae and Governor General Georges Vanier are presented not as the icons they became after the war, but as human beings coming to terms with their supreme vulnerability: "It focuses on a moment when they were truly human, when they were afraid, when they were wondering what on Earth they were doing in the trenches and if they were ever going to make it out alive," Melki says. Crystal sculptures by Toronto-based artist Mark Raynes Roberts, original scents developed in Magog, Que. by perfumer Alexandra Bachand, and archival photographs and artifacts help to complete the experience. For Roberts, working on the project was extremely moving. "The story is so beautiful, and it shows that out of the darkest places, where there’s pain and horror and death, comes beauty, and it transcends everything," he says. Following its engagement in Ottawa, War Flowers will travel to the Campbell House Museum in Toronto, and then to the visitor education centre at the Canadian National Memorial in Vimy, France, where it will open on the 101st anniversary of the decisive battle. It will then move on to the Château Ramezay Historic Site and Museum in Montreal.